The UPLAN suite of market modeling tools is uniquely equipped for the complex task of evaluating the worth of hydro assets. The built-in hydro-scheduler is unparalleled in the industry for its ability to use the detailed representation of the multiple watersheds to capture the optimal operating policy of hydro assets in competitive markets. The data takes into account each plant in every river basin operating in a region, as well as all the hydrological aspects of operation. The optimization maximizes the overall generator profits from serving the demand for electric energy with the available hydro and thermal generating resources, while respecting all the hydrological, thermal, transmission and demand constraints of the overall system. At the system level, the solution recognizes constraints such as load curves at the various demand centers, transmission network capabilities and reserve margins. At the individual generator level, the solution incorporates factors such as the outage rates and outage duration. 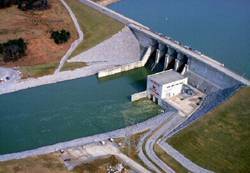 The strategic significance of hydro assets is the capability to store energy. Storage allows for competitive advantage through the tradeoff between offers made in the energy and ancillary service markets, which can be submitted or withdrawn depending on the prevailing prices during real-time. Storage plants make their bids based on the calculated water value in the Energy market. In the Ancillary Services market, the storage hydro can supply regulation in addition to spinning and non-spinning reserve capacity. Indeed, a major benefit of a hydro asset is the dominant position that this plant enjoys in the competitive market. chronological production costing and transmission power flow. The objective of the OPF is to maximize the combined value of the producers’ and consumers’ surplus based on offers, bids and reliability criteria, while accounting for the network constraints and plant operational characteristics. The hydro-thermal scheduling problem is set up to run over the planning horizon, solving one month at a time. The schedule produced satisfies the supply and demand balance each hour while determining the operation of the hydro resources over the whole month in one step. The scheduler simultaneously evaluates each of the hydro plants as an energy provider as well as an ancillary services provider. This ensures that the interaction between the energy and ancillary service markets is captured, and that the prices are free of arbitrage between the markets. The optimization algorithm internally commits (SCUC) and dispatches (SCED) hydro and traditional generators to develop the price and quantity of the hydro dispatched. Users may choose to dispatch the hydro against the load or load net of wind and minimize the total costs to the system. Alternatively, UPLAN provides an option to dispatch hydro and pumped storage against price profile to maximize the owner’s revenues. At system level, UPLAN coordinates the operation of the entire basin. In doing so, it looks into the starting and ending reservoir level due to natural inflows /outflows and hydro generation. The various system-related parameters and constraints are presented below. These are composed of rivers, streams, canals, and reservoirs. 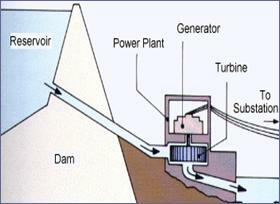 The discharge from one reservoir may flow into a stream that flows into another reservoir downstream. Streams and rivers within a common watershed must be recognized as sharing runoff in a series of mutual flow transactions. Successful resource management must account for the flow volumes between reservoirs in cascade, the time delays involved in flow from upstream to downstream and reservoir storage capacities. The optimization maximizes the overall generator profits from serving the demand for electric energy with the available hydro and thermal generating resources, while respecting all hydrological, thermal, transmission and demand constraints. The hydro-thermal scheduling/dispatching model is set up to run over the planning horizon, solving one month at a time. The scheduler simultaneously evaluates each of the hydro plants as an energy provider as well as an ancillary services provider.